Dietitians of Canada Cook! 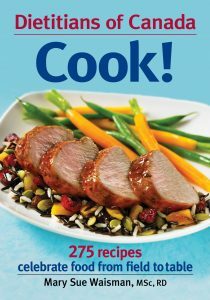 is a new cookbook developed by Canada’s national professional association for dietitians. It contains 275 recipes, collected from across Canada and using a variety of nutritious ingredients readily available in our country. The introduction provides information about the food groups and the nutrients provided in each, as well as advice about shopping, equipping your kitchen, involving the family in meal preparation, keeping costs down, local and organic foods and much more. The recipes are grouped into twelve chapters: Breakfast and Brunch; Lunches; Snacks, Dips and Appetizers; Soups; Salads; Chicken, Turkey and Duck; Beef, Pork, Lamb and Game; Fish and Seafood; Vegetarian Main Courses; Side Dishes; Muffins and Quick Breads; Desserts. 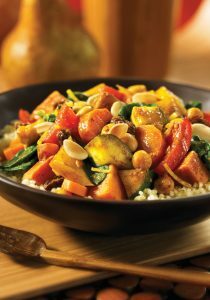 Each recipe includes a “Nutrients per serving” sidebar, preparation and serving tips, and variations. Because of its focus on good nutrition and on foods commonly eaten in Canada, this could make a great gift for children and grandchildren setting up their own first kitchens and starting to cook for themselves. 1. In a large Dutch oven, heat oil over medium heat. Sauté onions for 3 to 4 minutes or until softened. Add garlic, curry powder, cinnamon, turmeric and cayenne; sauté for 1 minute or until spices are fragrant. 2. Add broth and deglaze the pan, scraping up any brown bits. Add eggplant, sweet potatoes, carrots, yellow peppers and red peppers; sauté for 5 minutes. If vegetables begin to stick to the pan, add more broth. Excerpted from Dietitians of Canada, COOK! by Mary Sue Waisman © 2011 Robert Rose Inc. www.robertrose.ca Reprinted with permission. All rights reserved.